Agreed. It's no better than the which already has its own unique issues. And let's not forget that is for DELAY...I can recall adding about 10 minutes to my commute to work after a train had to be stalled near 135th Street due to signal work during rush hour, which is unfathomable given the﻿ sheer amount of commuters riding the subway at this time. And whenever there's no work on the tracks, trains are delayed because of so much door holding while passengers fail to realize that all those seconds holding doors add up very quickly to put the entire train (and all others behind it) behind schedule. Also, another issue happened at 167th Street on my way home from work when a train was taken out of service due to a jammed door. Re: the part in red... Well the train ALWAYS does this crap. I don't know what in the hell kind of "work" they are doing during effin rush hour!!! I have to be uptown a few times a week now, and this train has really gone to the crapper. It was always bad, but it's unconscionable to think it could get any worse. Crawl crawl crawl after 125th, honking, honking, honking, and I'm thinking what in the hell is going on that we crawl like this and all of this honking? I mean it's still rush hour!! Wait times are so bad now for the , that the and the look good in comparison. I wonder if they are short on trains? Possible because the waits are so long at times that it shouldn't be off-peak. The has already been the worst offender for regularity of service for quite a long time, and you can partly blame its extremely long route from the northernmost tip of Manhattan all the way to Ozone Park and the Rockaways. Not surprised as longer train routes tend to be less reliable than their shorter counterparts. I know but it's become even worse than what it was. There’s so many damn R32’s on the now. I love the R32’s but their time to carry such an important line like the has passed. They were a better fit on the as that line is shorter and is mostly outdoors. If they can’t put R32s on the and due to heavy wear and tear the same should apply to the . How does running underground accelerate wear and tear? In the summer especially, the HVAC system on the R32s are prone to overheating and breaking down underground. Plus the has heavier ridership and is longer than the . More people holding doors and more operating time also equals more chances for any train to break down. So by running R32s on the line, the A/C systems would be less prone to breakdowns as much of the line runs outdoors. Needless to say, a time warp into the 60s. But at least they feel more spacious than the newer R160s and R179s. I actually prefer the R160s and 179s. Better lighting and definitely more spacious than those narrow R62 cars. The least of the problems... More times than not they seem to be broken. Perhaps Bombardier's financial problems could be to blame for their poor quality? I bet they do (despite surviving on state aid from the Canadian government). There are hardly any R32s on the . And even if there were that “many”, it wouldn’t have made any difference than the R46s, which are just as bad, if not, more so than the R32s. Didn’t they sell off a couple of their aircraft patents to Airbus? You're only talking about the Bronx/CPW portion. 4 Av (Bklyn) and 6 Av (Manhattan) aren't so bad. 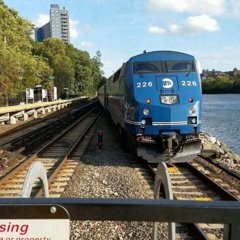 It's always Bronx commuters who get the worst service. After graduating college I'm moving out of that borough--and south Brooklyn is where I'm looking to find a new home. Preferably Sheepshead Bay or Brighton Beach, though I was also considering Bensonhurst despite not along the Brighton Line. At least they don't cut the down to every 16 minutes nearly as much as they used to. But yeah, all this crap definitely discourages a Bronxite to travel to the city during the weekends. I had family over for Thanksgiving and I had to persuade them to go to the city on Black Friday instead of shopping in the Bronx because on Friday it was a one-seat express on the subway, while Saturday that same ride would have been a 2-seat local that would have taken twice as long. Bronx isnt as bad. Its CPW and 4th Av is what ruins it. The basically primary serves Dyre Av line by itself and south of East 180 St it shares tracks with the and . Looking at the ridership figures, the Dyre Av stations get low ridership on weekends compared to lines like Pelham, White Plains Rd, and Jerome. So I can see why the MTA reduces the to every 20 minutes when there is work on Lex. Chicken or egg? Dyre hasn't gotten enough weekend in years; I'm unsurprised there's no ridership.